Note: this is a long post designed to browse and compare the top apps in this category. I’m a big user of Evernote because of its multiple access routes and platform support. So saying that, I realise that some people don’t get on with Evernote, or prefer other features. With the recent movement by Microsoft to make their own note-taking app a freenium version, there’s been an increase on blog posts on using OneNote. 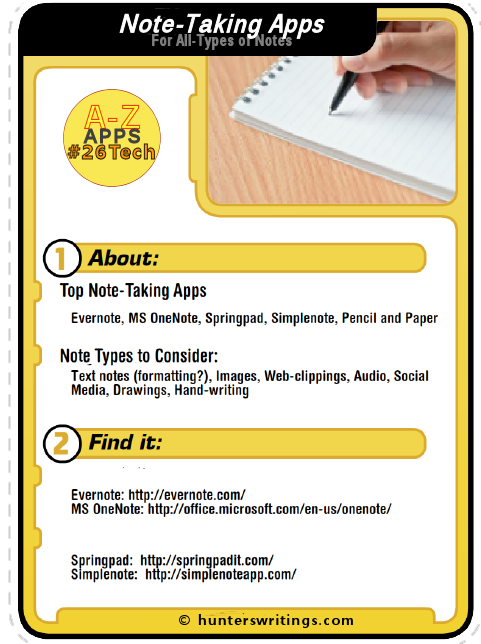 This one, on Lifehacker, compares Evernote and OneNote. All of the following note-taking apps sit in the same note-taking space for apps and offer some similar features, with slightly differing goals and uses. There are many people – like me, who make use of one or two of these apps in their work flow processes. With its large ecosystem of support apps, web clippers and hundreds of third party apps and services, Evernote’s ever-growing ecosystem for all-over note-taking and keeping on the cloud can’t be beat. Best for: people wanting a full-featured and free environment for document management, researching, web-clipping and paperless living. Premium users can also take all their notes, references and resources on-the-go. For: Windows & Mac Desktops, Webapp, iOS (iPhone & iPad), Android, Blackberry, Kindle, Windows 8, Windows Mobile. Webclippings: Supported with browser extensions and bookmarklets. Evernote Clearly cleans up websites for viewing also. The latest web clippers include annotation and markup technology supplied through Skitch. Document Support: Native document support including PDF annotations(Premium), and Office Document searches. OCR technology helps take handwritten documents and images into digital. Images can be annotated with labels and icons via Skitch functionality. Adding Notes: Type in-app, audio record in-app, drag and drop files, attach files, send-to-Evernote app extensions, email forwards, web-clippings, screen-clippings, third-party apps with integration, and more I’ve no doubt forgotten. Note Types: Audio and video notes (as attachments), images (inline, with OCR), document file attachments, image annotations (via Skitch), PDFs inline – can be read through the Foxit PDF reader in-app, rich text notes with hyperlinks, webclippings, screenshots, highlights, tables, reminders with dates, checklists, internal note links. Note Organisation and Find: Various ways to create note templates but none pre-ordained. Notes are organised in Notebooks and Notebook Stacks. They can be tagged also. Shortcuts to favourite notebooks or notes. Reminders with dates can be set on tasks. Notes can be found based on meta-data filter searches. OCR technology makes text in PDFs and images searchable. Sync and Share: Notes automatically synchronised across devices into Evernote cloud storage. Can be shared online, collaborated on, shared via social media or email links. Cost: The apps and most features are available through Evernote free. Premium and Business Users gain access to further upload limits and some additional document handling, plus offline access to notebooks on mobile devices. Website: Evernote (affiliate link, in that this gives you access to a free month’s usage of premium Evernote). Updated : June 25th 2014, Springpad has announced it will be closing down from this date. The reasons behind the shutdown have not been published. Migration facilities are available to take your Springpad data into Evernote, should you wish. At one point Springpad was a direct competitor with Evernote, but since changes in functionality and UI, Springpad has become more of a web-based personal assistant. 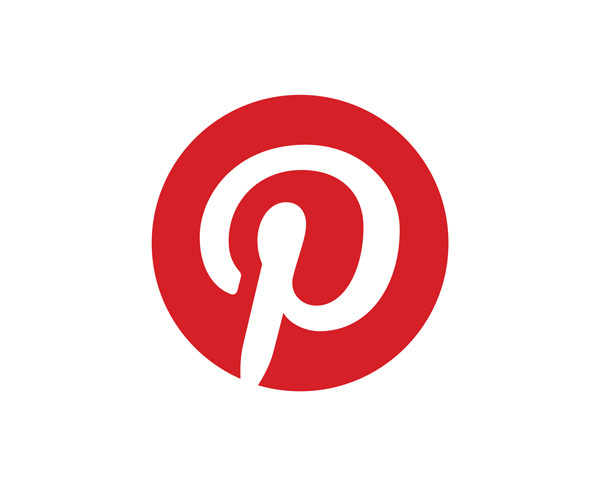 People who like a visual experience with blocks of notebooks, and an app that not only finds you compatible services and products but advises you when items you’ve clipped have changed in sales price etc (something Pinterest is doing now also); will enjoy using Springpad. Best for: Webclipping and curation in a nice design, keeping abreast of pricing and mapping options via personal assistance. For: Webapp, iOS (iPhone, iPod & iPad), Android, Kindle. Chrome browser users can access Springpad data offline – the local data is stored in the Springpad Chrome Web App. Webclippings: Supported with the Spring it! browser extensions and bookmarklets. Document Support: It is possible to add a file as a File note into Springpad, but there is a 25MB file size limitation for any notes. Springpad attempts to save entire files – if you’re browsing a website for ebooks, for instance, and clip a book, the app will attempt to save the book itself, not just an image. It also saves movies or videos in a similar fashion. Adding Notes: Type in notes, templated note types, webclipping into Springpad, email to app, scan barcodes of products, integration with Facebook or Twitter to send links through to Springpad. Note Types: Notes can include checklists, to-do lists with alerts and reminders, product images can be taken by mobile cameras or as web-clippings, barcode scanning. Note types are called Springs – these come in the following templated types: Alarm, Book, Bookmark/link, Checklist, Contact, Event, File, Movie, Music, Note, Photo, Place, Product, Recipe, Task, TV Show, Video, Wine. 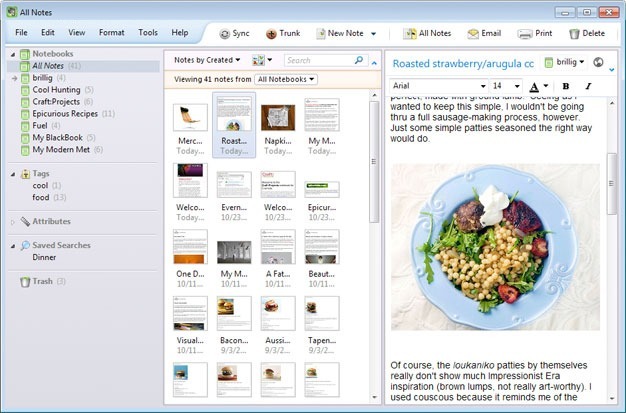 Note Organisation and Find: Notes can be stored into notebooks via a large list of pre-populated templated categories or project types; notebooks can be themed. Notes can be edited in bulk, and tagged for easy search. As a personal assistant, Springpad attempts to automatically categorise notes sent into it and to provide additional information eg. source products for you, via popular catalog websites such as Amazon, or provide a google map to a place you have noted. In-app notes like a weekly meal planner attempt to use your Springpad data. Springpad lately announced the Springpad Notebook “store” where you can browse and find several themed notebook setups for organisation, home-organisation, tasks etc. These notebooks are yours for the copy – the store is free. Board view – all your notes and images can be dropped onto a wall or corkboard-like page, and rearranged as a free-form project wall. Sync and Share: Notes automatically synchronised across devices into Springpad cloud storage. Can be shared online, to social media or plugged into websites. Springpad users can also be followed and you can watch their public notebooks. RSS feeds hook your Springpad task data up with Google calendars or ical calendars. Cost: Springpad is free. However there is a 25MB limit to any files or notes stored through Springpad. MS OneNote has a lot of popularity and deservedly so. Because it comes within many Microsoft Office packages (Windows), it already had a large holding with office workers and the educational market. Since the Freenium announcement, and delivery of a Mac version, more users are making use of OneNote through to OneDrive for storage. OneNote remains one of my firm favourites because of the structured tab format for note organisation, and the perhaps contradictory random placement of notes on a page – you can place them anywhere on a page. What lets OneNote down, for me, is the mobile apps. The OneNote iPad app has a lot lacking, and synchronisation through OneDrive is difficult in my many attempts. There is a third party app* which resolves some of these problems, but still has occasional issues with images and other files inside notes, especially whilst syncing across OneDrive. Without full mobile app support, OneNote – for me, is confined as a desktop app. For: Windows Desktops, iPAD app, iPhone app, Android App, Windows Mobile, Webapp (Office.com). A Mac OS app has just been released with the new freenium packaging of OneNote, although lacks many features. Web clipping: OneNote is supported through Windows integration. Hit Win+N to create a new note, hit Win+S for a screen clip. Internet Explorer users will find two web clipping options – Send to OneNote or Link to OneNote. Other browser users will need to work with roundabout extensions, or the Send to OneNote print menu option. 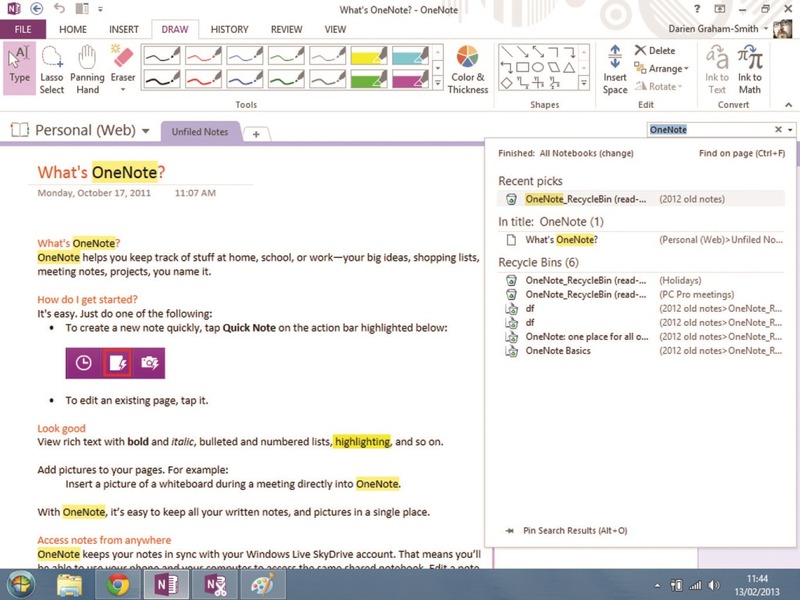 Document Support: As expected, OneNote supports many office files into notes. Files can be dragged and dropped into notes, with integration with Outlook emails also. Files can be linked to externally, embedded, or copied as a file insert. OneNote even has some mathematics functions – type in an equation with an equals sign and the app will fill the answer in. Adding Notes: Type in-app, record audio in-app, drag and drop files, attach files, plugin Send from Outlook, multi-media files such as videos can be dragged as content, and play buttons will be displayed. Ink notes let you hand-draw right into a box in a note – this can be coloured, highlighted, resized or converted to text. Quicknotes can be added via the OneNote button on the taskbar. Note Types: Rich text, images, hand-doodled drawings created onscreen, tables, hyperlinks, internal links, multi-media content, file attachments or embeds. There’s a large pre-populated template and notebook list to create new notes or notebooks from. Note Organisation and Find: Notes are structured as pages inside a traditional tabbed and binder layout. 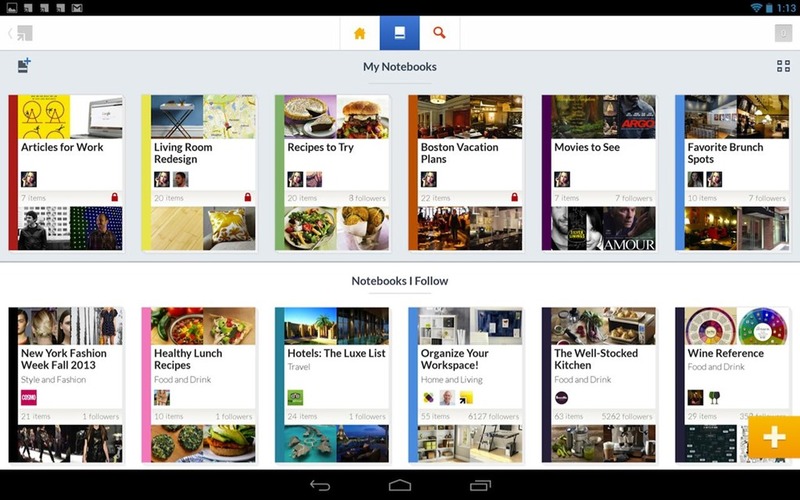 You can have a notebook with sections, pages and sub-pages. Content in these notes, however, can be placed anywhere on the page – Text is contained in boxes which can be moved around the page. Notes can be tagged and icon-labelled. Sync and Share: You can operate locally with OneNote notebooks, saving to your PC drive. If you want to access notes via the mobile apps, you will need to share via Microsoft’s OneDrive (newly renamed from SkyDrive) or SharePoint, using a Microsoft account. Notes can be shared on the web via a share link. Those shared notes can be edited also – via any browser or their favourite OneNote app. They don’t already need a OneNote sign-on to access. * Outline is an excellent 3rd party iPAD app which is good as a standalone note-taking tool on its own, but its unique power is in how it takes OneNote notebooks created on the PC and syncs them to the iPad or Mac (through OneDrive, Dropbox, or Box). The full structure of your notebook is displayed and editable. The free OneTastic addin provides a lot of functionality such as an in-app calendar view of your notes, pin to favourites ribbon, image crop, text from image and others. Cost: OneNote for Windows has previously had to be purchased via a MS Office package purchase. Many new Windows PCs come with OneNote pre-loaded, so check your program installs. Very recently Microsoft announced OneNote is now a freenium app – you can download it for free. The OneNote webapp, as part of the Office.com suite, is also free to use through OneDrive access. Google Keep has been around for a little time, and has Android Apps and Chrome extensions to support it via Google Drive content storage. Google’s search technology also enhances the product. The note-taking functions are relatively simply compared to the other big guns above. Keep lets you make lists, and insert some multimedia and reminders on notes. And also because it’s not well known, and is hidden from being found – if you have a Google account and are open in gmail or google+, search under the other apps and you won’t find Keep listed there. Keep is actually part of Drive. Keep does present notes in a nice simple block style – notes can have colours applied, and look like post-its on a board if you like that concept. #26Tech: This was the N post for my A to Z challenge, where this blog will be posting 26 days worth of Tech posts relevant to writers and creatives. #Evernote4Writers: This post formed part of an ongoing series to blog a book, “Evernote for Writers”. The posts from this series can be found under the tag: E4W, #Evernote4Writers,or #E4W. An index will be provided from the top menu. I ended up ditching evernote after I tried Zimilate – http://www.zimilate.com. You can save almost anything, including web pages, images, files, notes, etc. I really like the fact that you can organize collections of content any way I want, both hierarchically and with tags. Zimilate also saves the entire webpage to the cloud, including all the images and other assets, so you don’t have to worry about it disappearing. Plus instead of showing random images from the page, Zimilate creates a thumbnail of each saved webpage, which makes it fast and easy to locate content visually. You can also search the full text of anything you save. One of my big frustrations with other tools is I end up reading almost everything on a mobile device and there was no easy way to curate it. With Zimilate, if you email a link to a webpage from your mobile or tablet, it saves the entire webpage for you, which makes curation simple and easy. You can also email images and files. If you email a link to evernote, all you get is the link, which means you can’t search for it and if the webpage vanishes into the ether you’re SOL. Lastly, Zimilate recommends other similar, relevant collections from other users. Instead of bookmarking or following other collections, you just drag and drop them to add them to your own, and then you can browse and search the combined contents. Worth checking out, I like it much better than evernote. An interesting option in Zimilate, thanks Cole. I personally don’t want entire web pages, just the portion of content I want as research predominantly. I also get a lot out of the simple checklists and reminders in Evernote, and stacks of options in getting content into there. But Zimilate may well be useful if you want to make content public and shareable, and for businesses who do want full webpage designs or the additional reference links from sidebars etc. I also very much like the UI of the webapp – the block format and simple user controls in Zimilate make it look easy to pick up. Thanks for drawing my attention to it. After using evernote for a while, I also decided to switch to Zimilate. I love the hierarchical organization in addition to tags, and have found the interface to be cleaner and easier to use across all my devices. I have to say, now that i can email a link from the webpage or app on my phone and have Zimilate save the whole thing I’m never going back! Noticably the much anticipated feedly-evernote integration which came through recently also has similar functionality within feedly partial feeds – where the app attempts to send the entire article feed from source through to evernote. I’m glad so many people seem happy with Zimilate. It’s one I will look into at a later date. Does Zimilate have a desktop app? I keep seeing references to one but cannot find any place to download it from … even on the Zimilate website. I would consider making the switch from EverNote if I could be sure I could access my data when offline. Does Zimilate have a desktop version? I keep seeing references to one by have not come across a place to download it yet … even on the Zimilate website. I would consider it a serious contender to replace Evernote if I could be sure I’d have access to my data offline.